At the Vogue event, jewellery designer Nitya Arora (of Valliyan) and Masaba went the suit route wearing their two piece with lace bralets. Even though they didn’t fare very well under the camera flashes, I quite liked their suits. But, I probably would’ve paired different innerwear with the suits. Whose suit is more you? It was a Yousef Aljasmi gown for Jacqueline while at a recent awards event. A pop of red lip color, jewelry from Mahesh Notandass and Begani Jewels and pair of Jimmy Choos rounded out the actor’s look. For a dress that had so much movement, the hair felt far too limp in contrast. Also, we’ve seen versions of this fringe dress far too often. And so, even though Ms. Fernandez worked that dress, the look failed to make much of an impact on the red carpet. At ‘Women Of The Year’ awards, Rakul was photographed in Deme cut-out dress. Wearing her hair down, she rounded out the look with a glossy lip and understated jewelry. Though the color made for an interesting, the dress itself left us underwhelmed. P.S: Click on the image to enlarge. Nushrat gave us our second Caroline Bibawi sighting of the night. With her hair pulled back in to a wispy low ponytail, she rounded out the look with burgundy lip color and pair of discreet earrings from Jet Gems. The non-illusion illusion panel is always bit of a downer. Discounting that, she looked good. 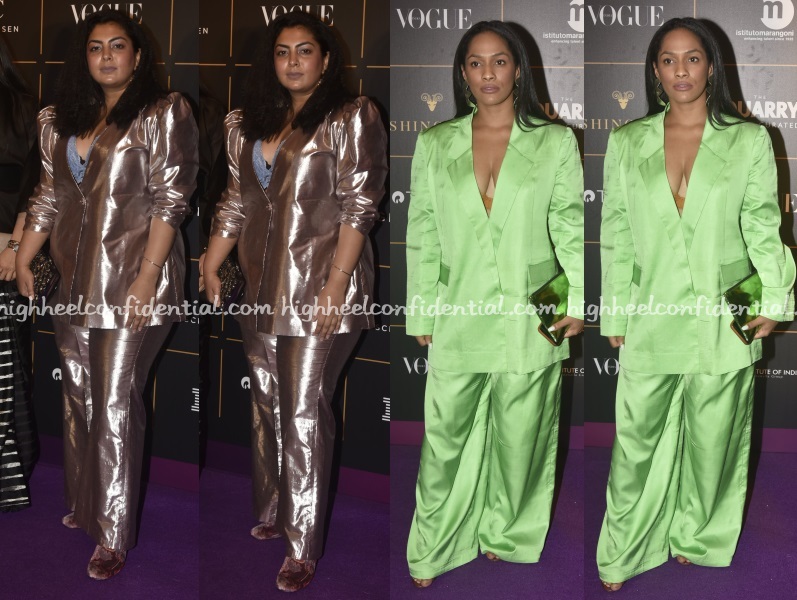 At the recently held Vogue awards, both Monica and Shibani were photographed sporting similar looks- bodysuits layered with sheer dresses that featured thigh-high slits. Both ladies rounded out their looks with pair of black heels. Whose look do you find yourself liking more? P.S: Monica is wearing Revolve and Dolce & Gabbana booties.